PORK TENDERLOIN: Combine 1/4 cup olive oil, orange juice, lime juice, garlic, spices and salt in a zipper-top bag. Add the pork, seal and massage to thoroughly coat the pork. Refrigerate at least 8 hours and up to 24 hours. Preheat oven to 350 degrees. Heat 2 tablespoons olive oil in a skillet or saute pan over medium-high heat. Remove pork from marinade. Place in the pan and sear well on all sides. Transfer pork to a baking sheet and place in the oven to finish cooking to an internal temperature of at least 145 degrees in the center. Tent to keep warm and rest 5 minutes. BLACK BEANS: While the pork is roasting, prepare the black beans. Wipe out the pan used to sear the pork. Heat olive oil over medium-high heat. Add the onion, reduce heat to medium and cook 5 to 6 minutes, stirring often until onion is softened. Add the poblano or bell pepper and continue to cook 3 to 4 minutes. Add the tomatoes and cook 3 to 4 minutes, then add the garlic, cumin and oregano and cook 15 seconds or until fragrant. Add the water (or broth) and beans and simmer 5 to 6 minutes or until heated through and vegetables are tender. Add hot sauce and salt and black pepper, to taste. Stir in cilantro. TO SERVE: After letting pork roast, slice it against the grain. 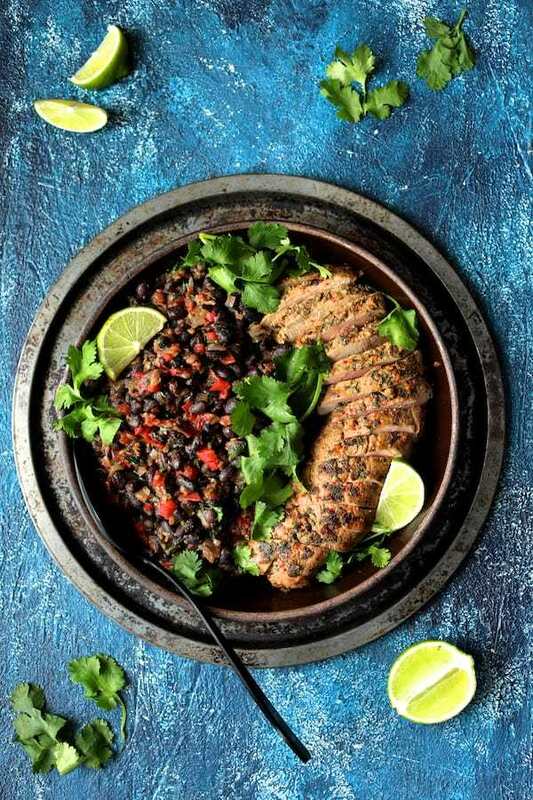 Serve with black beans, lime wedges and garnished with cilantro.